Oxford University is one of the finest institutions of higher learning in the world. However, Oxford would not amount to anything without an exceptional, and exceptional diverse student body. These visualizations by Andy Cotgreave show us exactly who makes up Oxford University. The main view that Andy starts with shows the geographical distribution of Oxfords student body, as you can see above. The interactive version allows the user can to change the view to represent Gender, Fee Status and Domicile. One of the nicest parts about this visualization is the table that aligns perfectly beneath it, with the applicable student counts. 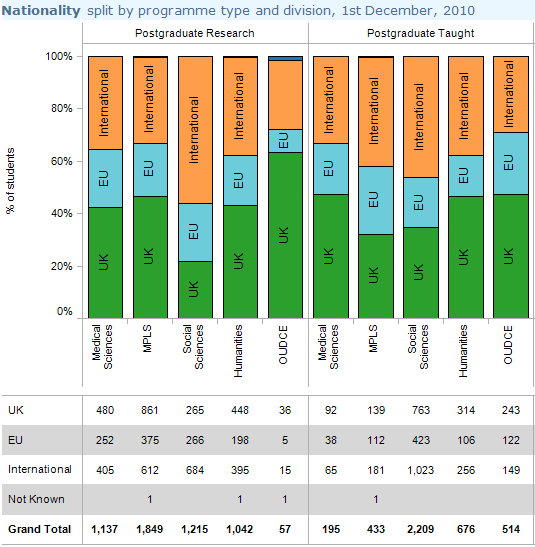 In other words, you can tell in just one view that over 40% of the Post Graduate Research Medical Sciences department is from the UK, and that corresponds to 480 students. 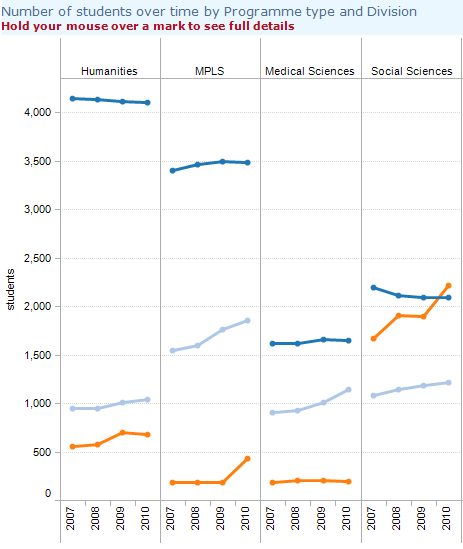 Andy has also created views showing the student count over time(below) that give context to the current status in the nationality view. In an effort to maintain the symmetry and beauty of Andy's originals, we opted not to alter them to fit our blog. You should definitely view the originals to see them as they were meant to be seen.